Valentine’s Day may be the day for lovers, but it was also the day where volunteers came together across 2 states to transport a little pug puppy named Brady to his foster home. I am a volunteer for SouthEast Pug Rescue & Adoption (SEPRA) and sometimes that means donating your time to get a needy pug to where they need to go. 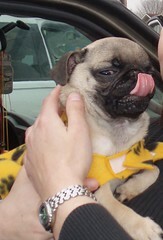 Brady was a sick little puppy that needed to go from Tennessee to Atlanta, GA to a specialist to further evaluate him. SEPRA knew that he was blind and might have some neurological issues, but there were still committed to accepting him into rescue and providing him with much needed medical care. One of the other volunteers and I met up at a parking lot just off the interstate for him to continue with me to Atlanta. Brady was so tiny and so pitiful. I loaded him into my front seat to strap him in his carrier and off we went. He cried for part of the drive and it just broke my heart. He finally settled in and got comfortable enough to sleep the last 45 miles of the trip. I was able to safely deliver him to his anxiously awaiting foster mom who welcomed him with open arms. So today was really the day to ‘Do What You Love’ vs. just a day with candy & flowers. When the request for drivers was sent out, it was only days after losing Louise. At first, I was not really “up” to it, but in the end, it made me feel so good to help another pug. I drove in honor of Louise. It was so hard to get out of the bed this morning. Partly because I was so emotionally exhausted and partly because I did not want to face reality. Every little thing reminds me of Louise. I have gone through so many ranges and degrees of emotions day. I spent a good deal of time in denial. It was easy to immerse myself in work and pretend that yesterday was just a bad dream. Sometimes, my mind would wander, and I would think about the tragedy of loosing Louise and would again be overcome with sadness. I have felt confused-how am I and the other pugs and my family going to make it without Louise? 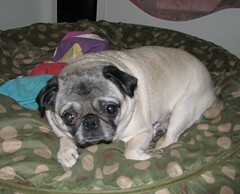 I have felt sorrow for Lola and the other pugs who can’t express their pain of losing their sister. I have also felt the emotion of gratitude today. I want to thank everyone for their kind words of condolences and support. Every single time I would get an email, voicemail, txt, or message from a family member, a friend, a pug person, or a complete stranger, it has brought tears streaming down my face. But in an odd way, it has starting to heal a terrible void in my heart. I think that when we hear about someone losing a pet that we are reminded that these furry little creatures are a part of our families. I know that when people have said they have cried with me and for me that they are telling me the truth. I think that when we hear about someone losing a baby, we cry for every cat, dog, bird, fish who has ever lost their life. We cry about the thoughts of losing another pet. We cry for ourselves and the pain that it causes. I know that there will probably be many more tears and many more pulling the covers over my head moments, but I know that I’ll get through this with the support and understanding of everyone surrounding me. I took Louise to the vet’s office for a dental and possible soft palate trim. She really wanted to ride in my lap on the way out there and I felt so bad that she couldn’t because I had on a black sweater (now I wish that I’d let her). My biggest concern about the dental was that if she had an infection/abscesses that I did not want to have to pull a bunch of teeth. She had to have something to fight with Lola! Standifer Gap called me just a little after 1:00pm. I really thought that they were calling to say Louise’s teeth were worse that I thought. But unfortunately, it was to say that Louise has stopped breathing, but that they were working on her. I have been out there enough to know when and why they call a pet’s owner to know that things were not good. I let them know I just so happened to be in the car and was on my way out there. I can tell you it was the longest drive. I had a 1,000 thoughts going through my head. I didn’t cry until Andre’ just so happened to call and I told him what was happening and that I was on my way out there. I was just about to pull up when Dr. Katie called. I knew then. I pulled up and she came outside to meet me. We both cried. I went inside to see Louise and to pet her. She was wrapped in a blanket waiting for me. It was like she was sleeping and I wanted so badly for her to wake up. Everything was done right. The pre-blood work was done. She had the EKG set up. She got the special anesthesia for older dogs. They had just given her the anesthesia when she stopped breathing and they started working to revive her before her heart even stopped. They gave her the drug to come out of the anesthesia, but nothing worked. Thankfully, Louise probably did not even know anything. Dr. Katie and Dr. Kate Allison were there along with the other staff and I know that they did everything they could for Louise. Everyone was just as upset as I was. We are going to send her body to UT for a necropsy. Part of me hopes that there was some underlying condition and that all of this can be justified, but really, it could just as easily be nothing more than an allergic reaction to the drugs. I know this may sound horrible, but I looked at her teeth, because I did not want to feel like I should not have even taken her in for an elective surgery. They really did need cleaning and Dr. Katie said that her soft palate was folded over and it would have only gotten worse. Once again, everything was done for the right reasons, just a bad outcome. I know how much everyone at Standifer Gap cares for the animals and I wish that this hadn’t happened to them either. I called Andre’ so that he could come out and say good-bye to Louise. He was already on his way. I am so glad that he got to pet her and hug her too. When we were leaving, I said to Andre’ what we were both thinking, “poor Lola.” Lola can’t do anything without her sister. Even though they fought for Alpha dog position, she would go get in the doggie bed with Louise every time! Andre’ and I both came home, got Lola, Teddy, and Baby Girl and got in the bed. We hugged them and silently cried into our pillows. 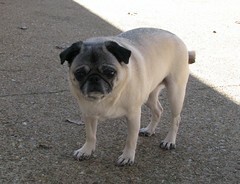 Louise was my first pug and the boss of all the rest of our pugs and any other pug that came through the house. She was always the first one at the door to great me! She ruled the neighborhood from behind her 3′ tall fence. She was sweet and naughty at the same time. Even though she wasn’t the oldest of our group, she was like my first born and I would always tell her that if she would just out live the others, she could be an only pug again. 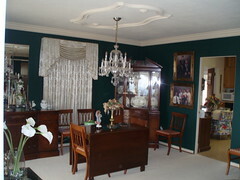 For some people, they may look at this picture and see just a dining room. For me, I see so much more. I see three houses: the “little house”, our house, and the “big house.” You see Mr. Miller was known as the Concrete King of Chattanooga and although is specialty was commercial buildings; he built himself & his family these three house. In the 1930’s he built his family a two bedroom stucco house-that I have named the “little house.” Our house was built in 1950 and I have loved this house from the very first time that I saw it. It has so much character and there is nothing else like it (okay besides the other two houses!). There is so much attention to detail and the quality of construction can’t be beat. Then there is the “big house,” and not necessarily in size, but more in location on top of the mountain overlooking the city. Even though the outside is brick instead of stucco, Mr. Miller still made sure his last house had the same high standards as his previous houses. All three houses have or had multiple lots. All houses have oak hardwood floors. All houses have the formed window & doorways instead of traditional moldings. All houses have the terra cotta tiles for the fireplace hearth. I am honored to love and take care of our house and have it represent not only a man, but his family too! 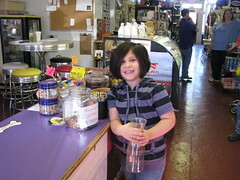 Chattanooga Pugs would like to thank Aunt Sue’s K-9 Bakery for all of the generous hospitality. Charles & Eneva Shaw and their entire staff always welcome our snorting group with welcome arms. Aunt Sue’s bakes their own gourmet treats for your canine companion. They also carry premium dog & cat foods and supplies. They have a great selection of gifts for canine or feline fans! If you are in the Chattanooga area or are visiting, please go by and support this local business. 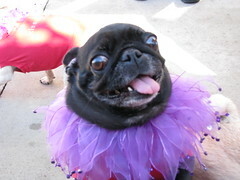 Chattanooga Pugs had their annual Purple Pug Party at Aunt Sue’s K-9 Bakery. We have been doing this as our February Meet Up for a couple of years now and it is always so fun to see what purple attire the pugs will be wearing! And their people owners! We had about 15 pugs this year with a variety of lilac, lavender, and plum to show off their colors. 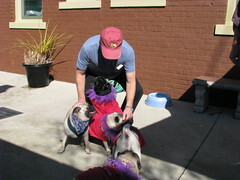 I dressed our 4 pugs in red bling’d out t-shirts and purple party collars. Papa’s Pugs love meet ups: they get to get dressed up in party clothes, they get to ride in the car, they get to see their pug friends, they usually get treats (that someone else is handing out), and for us-they sleep the rest of the day from exhaustion! You are currently browsing the papaspugs.com Blog blog archives for February, 2009.